"The strength of the pack is the wolf, the strength of the wolf is the pack." 3rd Light Armored Reconnaissance Battalion (3rd LAR) is a mechanized infantry battalion of the United States Marine Corps. Their primary weapon system is the LAV-25 and they are part of the 1st Marine Division and I Marine Expeditionary Force. The unit is based out of the Marine Corps Air Ground Combat Center Twentynine Palms, California. An LAV Company consists 5 Platoons which utilize 3-4 vehicles usually divided into Headquarters(HQ) 1st, 2nd, 3rd and Weapons Platoons. Each platoon has a commander whom controls each section and is also the vehicle commander (VC) of one of the LAV'S, while the platoon sergeant will command another vehicle. A senior corporal or sergeant will command the other vehicles. The company commander commands a LAV-25 in the HQ platoon, the other HQ platoon LAV-25 is commanded by the company's Master Gunner or HQ platoon Sergeant. The company First Sergeant and Company Ops Chief command the 2 LAV-LOGs in the HQ platoon. A crew consists of a driver, usually the least senior (0313, the MOS designation for LAV Crewman), a VC and the gunner. The gunner operates the main gun, the M242 Bushmaster chaingun. The VC makes target acquisition changes and helps the gunner make adjustments. The remaining crew consists of Scouts (0311). The LAV can hold as many as 6 scouts, but in most cases there are only 3-4 in the back. There is also 1 corpsman and 1 2147 LAV Mechanic per platoon. The 3d Light Armored Vehicle Battalion originally began as Company A (Reinforced), 1st Light Armored Vehicle Battalion in May 1983, and began receiving LAVs in April 1984. Company A, 1st Light Armored Vehicle Battalion became Company A, 3d Light Armored Vehicle Battalion in late 1985. The 3d Light Armored Vehicle Battalion, 27th Marines, 7th Marine Amphibious Brigade was activated on 11 September 1986. The Battalion was re-designated as the 3d Light Armored Infantry Battalion on 1 October 1988 and subsequently relocated to Okinawa, Japan in February 1989. The Battalion returned to Twentynine Palms on 18 July 1991 as part of Regimental Combat Team 7 (RCT-7). Detachment 3d Light Armored Infantry Battalion deployed to Saudi Arabia on 16 August 1990 in support of Operation Desert Shield, as part of the 7th Marine Expeditionary Brigade, Task Force Lima. Later, the battalion conducted screening and deception operations as part of Task Force Shepherd, the forward unit of 1st Marine Division. On 25 January 1991, Company B saw combat in the first ground offensive action of the war by participating in an artillery raid with 5th Battalion, 11th Marines. On the night of 29 January 1991, during the battle of Umm Hjul, Company D was the primary unit to turn back a major Iraqi attack. Once the ground war commenced, 3d Light Armored Infantry Battalion again found itself at the forefront of action. While assigned to the First Marine Division Command Post on the second day of the ground war, Company B decisively repelled an Iraqi counterattack on the Command Post. Additionally, Company D provided a mobile screen for Task Force Ripper, the leading unit for the Division. On the third day of the ground offensive, Task Force Shepherd was the first coalition force to enter Kuwait City and captured the Kuwait International Airport. When a large earthquake hit the Philippines, the Company A participated in relief efforts. In April 1991, Mount Pinatubo erupted and once again, Company A was called upon to provide security against looters and participated in the clean up efforts. Company A returned to TwentyNine Palms on 7 August 1991, completing an arduous 15-month deployment. From December 1992 to April 1993, 3d Light Armored Infantry Battalion deployed Company B and Company C along with the forward command group and forward logistics support for Operation Restore Hope in Somalia. The mission consisted of convoy escorts, delivering over 4,000 metric tons of grain to outlying areas. On 1 March 1994, 3d Light Armored Infantry Battalion was re-designated as 3d Light Armored Reconnaissance (LAR) Battalion. The Battalion also participated in counter-drug operations in support of Joint Task Force 6 in Arizona throughout 1994. It was during the early 1990s that the battalion’s nickname and radio call sign became “Wolfpack.” 3d LAR Battalion also continued to support the 1st Marine Division’s Unit Deployment Program requirement by rotating an LAR company to Okinawa, Japan every six months. In December 1998, Company A, 2nd Platoon participated in Operation Desert Fox while attached to Battalion Landing Team (BLT) 2/4 31st Marine Expeditionary Unit (MEU). Operation Desert Fox was a major coalition air campaign launched against Iraq for failing to comply with U.N. Security Resolutions. During this operation, BLT 2/4 established defensive positions in Kuwait, along Mutla Ridge, to deter a potential counter offensive by Iraq. In late January through February 2003, the Battalion, with the exception of Company C (on unit deployment in Okinawa), deployed with the 1st Marine Division to Kuwait in support of Operation Enduring Freedom. Upon arrival, the Battalion attached Company B, 4th LAR Battalion, which was subsequently re-designated as Company E. On 21 March, 3d LAR Battalion and its attachments crossed into Iraq with the beginning of Operation Iraqi Freedom, attacking into the Rumaylah oil fields. The Wolfpack, along with 1st Light Armored Reconnaissance Battalion, led the Division’s lightning attack north, passing through Task Force Tarawa 56 hours after attacking into Iraq, crossing the Euphrates, and continuing to attack north along Highway 1. On 23 March 2003, while advancing hundreds of kilometers in front of the Division to seize a bridge over the Tigris River, the battalion uncovered a night ambush by dozens of Iraqi irregular forces known as the Fedeyeen. This was the first major and only battalion-level engagement of the war which resulted in several dozen enemy killed in action and the destruction of Iraqi armor forces attempting to maneuver south against the Division. From the afternoon of 24 March until 1 April, the Battalion was attached to Regimental Combat Team 5. Marines talk with rescued American POWs on a C-130 Hercules. On 31 March, the Battalion attacked north as part of Regimental Combat Team 5 and secured the northern portion of Hantush Airfield. On 10 April, the Battalion was tasked to provide a headquarters and two companies to Task Force Tripoli. This ad-hoc task force, composed of elements of 1st, 2nd and 3rd Light Armored Reconnaissance Battalions, as well as G/2/23 and TOW plt, 1st Tank Battalion, and commanded by the assistant Division commander, continued to attack north towards Tikrit. The remainder of Task Force Wolfpack, Companies B, E, and approximately half of H&S Company, as well as the Rear Command Post element, remained outside Baghdad conducting stabilization operations while attached to 3rd Assault Amphibian Battalion. In its advance north towards Tikrit, the element of the Battalion attached to Task Force Tripoli made national headlines in the town of Samarra on 13 April when members of Company D rescued 7 American servicemen who had been taken prisoner earlier in the conflict. The rescued prisoners included two Army helicopter pilots and Shoshanna Johnson, a soldier from the same unit as Jessica Lynch. An image from this moment is captured in the “Operation Iraqi Freedom” mural on a building in 29 Palms. The Battalion reformed in Ad Diwaniyah on 21 April. By mid-June, the entire Battalion had redeployed to Twenty-nine Palms, with the last elements of the Division following in September. The Battalion suffered two non-combat deaths, no killed in action, and nine wounded in action during this deployment. In November 2003, the Battalion was given a warning order to prepare to redeploy in August to Iraq in support of the Division’s resumption of support and stability operations in the Al Anbar province. The Battalion was ordered to deploy in August 2004 for a seven-month period. 3rd LAR conducted a relief in place with 1st Light Armored Reconnaissance Battalion at Korean Village, 35 miles (56 km) west of the city of Ar Rutbah, and fell under Regimental Combat Team 7. During the early part of the deployment, Company D operated out of Al Qaim, north of the Euphrates River and along the Syrian border, while the remainder of the Battalion operated out of Korean Village. Beginning 7 November 2004 Task Force Wolfpack led by Company C and parts of Company A participated in Operation Phantom Fury, the Division’s operation to retake Fallujah. Task Force Wolfpack’s primary mission was to attack to seize three key objectives on the Fallujah Peninsula—-the North and South Bridges and the Fallujah Hospital. Task Force Wolfpack suffered one killed in action and sixty-two wounded in action during this battle. During this time, Company D was attached to 1st Battalion, 23rd Marines and operated near the cities of Hit and Haditha securing the main supply routes and patrolling known insurgent areas. In late November, Task Force Wolfpack departed the Fallujah peninsula and was attached to the US Army’s 2nd Brigade Combat Team (2BCT), 2nd Infantry Division in Ramadi and supported the 2005 Iraqi national and provincial elections. Upon completion of these operations in early March, Task Force Wolfpack returned to Korean Village where the Battalion reformed and subsequently conducted a relief in place with 2nd Light Armored Reconnaissance Battalion. The Battalion redeployed to the United States in early April 2005 and began preparations to redeploy to Iraq the following year. In March 2006, 3rd LAR deployed in support of OIF 05-07.1 and subsequently became Task Force WOLFPACK by attaching C/1/10 as a provisional infantry company, one HET detachment and one CAG detachment. Immediately upon arrival, Task Force WOLFPACK detached Company D to RCT-5 in Fallujah to reinforce this AO in order to support decisive operations in and around Baghdad, Iraq. In June 2006, Task Force WOLFPACK received Company D back from RCT-5 and began conducting more aggressive Counter Insurgency (COIN) operations in and around Ar Rutbah, Iraq. 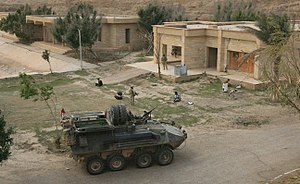 In July 2006, Task Force WOLFPACK was tasked with splitting the battalion by providing a headquarters and maneuver capability to operate near Rawah, Iraq. Task Force Rutbah, which consisted of Company A, 3d LAR, C/1/10 and one half of Headquarters and Service Company (-), 3d LAR continued to conduct counter-insurgency operations in and around Ar Rutbah, Iraq. Task Force Rawah, consisting of one half of Headquarters and Service Company (-) (REIN), 3d LAR and Company D, 3d LAR, conducted a RIP with 4-14 CAV and subsequently began COIN operations in and around Rawah and Anah, Iraq. In September 2006, Task Force Rutbah and Task Force Rawah conducted a RIP with 2d LAR in both areas of operation. By early October 2006, the battalion had redeployed to Twentynine Palms, CA. Scouts napping after a patrol. Marines of 3rd LAR pray during a memorial service for their fallen brothers. Scouts from 3rd Lar patrol the streets of Anah, Iraq (2006).